It is strange how much people trust the DNA to tell them the truth. As one participant at a recent conference said, it is our Book of Life today. People trust DNA evidence to solve all crimes and DNA tests to solve all diseases. But we don't trust the people managing it. This week's CNEhealth.org Blog was about DNA registers and biobanks. Some want to expand them, some think it would hurt civil liberties. Most interestingly, Swedes are really negative to it all in surveys while quite positive in practical action. My explanation for this paradox is that Swedish people in general trust their police and researchers - we have not had that many scandals undermining confidence in them as institutions. But they don't trust the oversight system of politicians, science councils and ethical committees. These are seen as largely opaque groups with little accountability and quite possibly with ethical agendas divergent from the public's. So people want to keep an eye on them, not the researchers or police. Of course, in official Sweden the views are reverse: politicians and science administrators love the ethical councils and their presumably objective and good evaluations of everything and everyone. Individual scientists and policemen cannot be trusted, and the public has no idea about what goes on in science, ethics or politics. That scientists sometimes "shop" between committees to get one that will approve an experiment or that they ideally should represent the ethical views of people rather than a certain elite, that is lost on them. There is also the usual difference between statements - here general principles and what is seen as socially agreed on (in this case a greenish suspicion of biotech) - and action, where practical issues become more significant (it is a bother protesting against the use of DNA samples, and besides there is no real cost of allowing experiments or storage). The status quo bias is strong. Voters only react when they think the government or its appointed organisations are too self-serving or acting against the voters' interests. Hence there is little need to worry about the DNA registers and their management, but much more to worry about their oversight. Ti build trust one need openness, accountability and some shared moral assumptions or at least the acknowledgment of legitimacy. But setting up ethical institutions has far too often become a way for decisionmakers to avoid responsibility themselves (compare this with the recent fad for ethical consultants among many companies). Each new layer just decreases the transparency and diffuses the accountability (if a truly nasty experiment gets done, do we blame the researchers or the ethical council that approved it or the politicians who put them there? ), and given how little interest there is among politicians to stand up for any form of coherent ethical discussion there is good reason to believe that the ethics or legitimacy is not felt that strongly. What to do? Perhaps the key point is to avoid moving responsibility too high up. Let researchers do their experiments, but insist on transparency and accountability. Ethical councils could gain much by acting as an interface between researchers and the public (not the NGOs usually calling themselves the public). In many cases abuses are better handled through other methods: fraudulent net/postal DNA tests are mail fraud, misuse of DNA records by the police a matter for Internal Affairs. The standard map is indeed a standard map, the canonical demonstration of how a conservative dynamical system breaks down into chaos as it becomes nonlinear. While strange attractors might have the best press, conservative systems have wonderfully complex dynamics. So what are the lyapunov exponents of the standard map? Even if you, dear reader, do not understand anything of the previous I hope the following colorful fractal images might be pleasant viewing. The lyapunov exponents tell how a small ball centered around a point is expanded and squeezed by the dynamics. Positive exponents imply directions where points are separated, negative exponents mean convergence. A conservative 2D map has just one exponent of interest since any expansion has to be counteracted by a equal contraction - the two exponents are equal but with oppisite signs. As the map becomes more chaotic, thin bands near hyperbolic fixed points become chaotic as they become homoclinic points and surround themselves with tangles (I'm reminded of the neurofiliamentary tangles of Alzheimer's disease). These orbits show up as the red or yellow bands in the maps. The (0,0) point tangle is especially visible in the corners. To get real high-intensity chaos you need space, and hence the largest bands also have the biggest exponents. But as more and more periodic orbits break down we get space-filling chaos. What about the color inside the non-chaotic blue areas? The color differences are caused due to different orbits circling the central fixed point at different speeds - there is divergence of orbits here too, just not very fast. Properly, the lyapunov exponent should be 1 since the divergence is not exponential (I think). This suggests that the real exponent actually increases from 1 to a finite value at the border between the regions. But the border is the usual kind of Cantor set times reals you get from Smale horseshoes, making the exponent as function of the position a very wild function - discontinous, oscillating like ceil(sin(1/x)) as one approaches a boundary - and the boundaries form a fractal set. To make matters worse, the KAM theorem shows that the chaotic and non-chaotic regions for some values of K both have non-zero measure, producing areas of positive measure where the lyapunov exponent function is nonzero in a dense set. So it is not just discontinous here and there, but across entire areas. I approximated the exponent using a simple method: iterate a orbit xn starting from a point x0 together with another orbit starting nearby at x0+epsilon, and calculate the difference after a few iterations. To get better pictures I repeated this a number of times and with different number of iterations (in order to avoid artefacts due to the periodicity of some orbits). The "proper" way of calculating the largest exponent is to keep a single parallel orbit yn, calculate log(||x-y||/epsilon) and then move yn back towards xn so that it is epsilon units away (but in the same direction) each iteration. The average of the log-distances is an approximation of the exponent. I tried this also, but the images got more messy, likely due to the introduction of errors during the tricky normalization step. CNEhealth.org Blog in the light of the Vioxx and Prozac debates. How can we tell when the risks outweigh the benefits, when trials are too expensive, biased and sometimes unethical and benefits not necessarily anything that can be quantitively measured? The key point is that the current drug testing and regulation system works best on new drugs that cure an operationally well-defined condition. There is no old drug to compare with, requiring people to do inter-drug tests rather than drug-placebo tests (since it would be unethical to do that if there is a cure). Also, there are not yet vested interests promoting one drug before the other. The condition needs to be well-defined and measurable, so that one can tell if the drug works objectively. Did the patients survive, did the fever decrease? But as medicine advances we get more and more drugs intended to promote health - a state of high life quality - rather than just remove a clearly negative condition. How do we measure whether they achieve that, to what extent and whether this extent is great enough to outweigh the risks? These questions are hardly new, and have been discussed in the medical profession endlessly. But as health policy grows more and more political, it means that these questions move into the political sphere. In a few years we will vote about our definitions of health if we are lucky. If we are unlucky we will have a commission (which may or may not include the medical profession and certainly will include some savings-hungry politicians) deciding for us with little public input but great effect on medical availability. The best way of dealing with the qualitative aspects of health is to leave as much open for informed individual choice. As long as availability of medicines is centrally controlled according to the seemingly objective numbers of a few trials we will get more optimization of public health in the sense of public health expenditures and politically convenient risk aversion than improving the health of individuals. It is the classic information problem: the patients and their local doctors know best how their health works, but the central planner only knows aggregate numbers. If patient/doctor teams can gain health information easily and flexibly to make informed choices, and if the local information about side-effects and experiences can be aggregated efficiently (e.g. by local reports through the net into data mining systems) then the importance of large-scale centralized trials could be decreased. But it will take a strong doctor-patient collaboration, some advances in e-medicine and a deliberate push towards a more voluntaristic pharmaceutical regulation system and health insurance system. Fischer's quote reflects a common sceptical view of medicine: we know a lot of the pills we take are not that powerful compared to placebos. At the same time we dearly hope they are as powerful as the alchemical elixir of life. And as free from side-effects as the elixir was reputed to be. We manage to be both cynical about the efficacy and safety of drugs, yet take them eagerly. Which probably goes to show that most people are not very committed cynics. One thing I like about Brussels Airport is the art. Most airports have some art, but BRU actually has a lot of it. 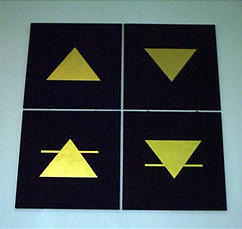 My personal favorite is Swimberghe's "The Four Elements": the symbols of the four elements in goldleaf on square fields of indigo. 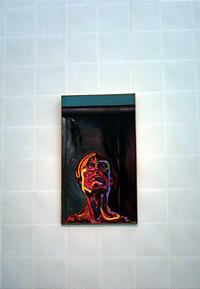 It is a large piece hanging somewhat forgotten on a wall to the right of the arrivals desks. The contrast between the wall, the squares and the gold is quite breathtaking. It is very reminiscent of 4 of disks in the Thoth tarot; the airport as a castle of power. In general the huge walls of airports work well for monumental art, while the smaller passages leaves room for more person-sized experiences. Szymkowicz's dreaming head in front of the escalators is perfect to watch as one gets lost among the levels (BRU is an unusually vertical airport, and one is forced to go up and down escalators far too often - isn't Belgium supposed to be flat?). 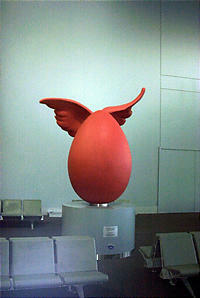 The terracotta flying egg at gate A40 manages to be both heavy and light at the same time (although Swedish passengers might get a slightly irreverent association to "The Fighting Ägg" of Leif :-). Of course, as with all public art there are plenty of things that doesn't speak to me, or produce the exclamation "I could do that too!". But surprisingly much is accessible and fun - be it crystal mushroom seats, statues of men with propeller heads, geometric diagrams enscribing classic art or the spare-part robot-with-planet sculpture. It is unusual that there are so few corporate art metal piles like Moeschal's "The Airway" or the boring neon avenues at the long connection tunnel. Maybe the airport authorities have realized that the art is for the customers rather than to show that the airport cares about culture. If only politicians thought that way. 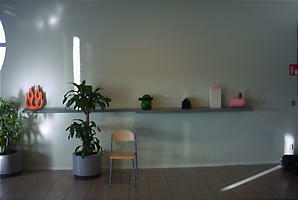 I noticed a cute little piece at Bromma airport too. Something in between a set of icons and a sculptural cartoon. Perfect to while away the wait with. Brussels seems to have become a bad habit of mine. This week I attended the CNE Health Conference on the Politics of Healthy Ageing and European Public Opinion. Robert Perkins of the Consensus Research Group presented the result of a survey of European opinions about health care. The main finding is that the majority everywhere is dissatisfied with health care: just 35% are satisfied, and younger people are less satisfied than older. 55% think quality has declined the last ten years. This is of course different from objective measurements of health in terms of life expectancy and other measures, where the trend is quite positive. But the perception is fairly negative. People blame the government for the lack of improvement – maybe because governments are the totally dominant providers/regulators. At the same time people perceive health as one of the most important political issues (just second to job creation), and this makes it a potential wedge to drive political change. On the other hand, had the market run everything, I have little doubt that the situation would have been similar. While lack of choice is a factor to consider, I think an even stronger factor is lack of service: the lack of customer orientation in throughput-driven care is felt much more acutely than any treatment outcome. As long as the money comes from somebody else than the patient, the doctor has to serve that interest, not the patient. Another factor to worry about is the demographic reality: people are getting older, and by 2050 the median European age will be 50 – assuming that no ageing breakthroughs occur during the time, something I hold unlikely. And elderly people demand more healthcare spending and vote more. They do not care about prices per se – health is worth quite a bit to people – but they really care about access: knowing a treatment exists but finding it not covered in the health coverage truly angers them. The public don’t accept the politicians’ excuses of pressed finances as legitimate reasons for reducing health care provisions: they demand cutting back on wasteful spending and to have more say in how healthcare looks. Interestingly, doctors seem to agree. They considers bureaucratic interference causes the declines, that the government needs to find alternative forms of funding and that the public needs more good information about preventative medicine. This last point is echoed by people: public access to accurate and up-to-date healthcare information is seen as important. It reflects the changing-patient doctor relationship, as people want to promote their health when they are not sick (and when sick, have information equity with their doctor). Healthy ageing programs that help people stay well is more important than development of new pharmaceuticals (which is still something 43% think is great). People want information, not governments promoting certain lifestyles (for financial reasons?). Of course, the politician’s response is largely heads in the sand. Do a bit, fiddle with the system and hope the problem goes away. A typical example is how the EU did not add health to the NAFTA talks – trade and globalisation of healthcare is a big no-no to the European mindset. Christoffer Fjellner, Swedish MEP from the conservative/liberal Moderate Party, did a fun talk where he compared the amazing development of cellular phones (brandishing his latest Ericsson model, of course) with how healthcare is treated. Just as when Ericsson launches a new phone, the government rejoices when Astra launches a new drug – but when the patients want it, it suddenly becomes an expense to be resisted at all costs. Phones are really the same thing, they also induce costs, but now the costs are borne by the customers rather than the government. But this situation makes the government health monopoly see medical advances as a problem rather than something giving people the life quality they desire – because it is only experiencing the cost, not the value. But to truly get a payoff from medicine, we must start treat it as a tradable goods, not something sacred to be provided. Europe is great at health and wellness, and with the right outlook could leverage the potential problem of many health-conscious elderly into a competitive advantage. Europe could become the world’s spa, rehabilitation and treatment centre. Or it could face a situation where the better off go on medical holidays to Thailand leaving the rest to struggle over the pieces of the finite cake. Of course, the proper way of reforming healthcare in the EU is not obvious. Each country has its own system, and there are so many different ways: adjusting the delivery of health from providers, how third party payers allocate funding, how the third party payers are funded by the citizens and how the oversight should work. Taxation versus insurance? What kind of provider and procurement markets? Ben Irvine, director of Health projects of the International Policy Network, did a survey of current trends. Overall, things are loosening up and moving across Europe (with an exception of frozen solid Sweden where private hospitals are being banned). In the tax-founded countries management and competition are being improved, in the insurance countries macroeconomic controls are put into place to keep costs down. Irvine suggested keeping an eye on the Netherlands and the UK to see what happens when (or if) they reform their systems, as indicators of where we are going. Despite what might be thought, regulatory authority is being increasingly centralised right now. Even where patients can choose between competing hospitals with their competing insurance companies, the governments are getting involved in defining cost, treatment guidelines and inspection/audit regimes. The medical profession gets excluded from policy-making, a risky trend. The entire event demonstrated how far away the Swedish debate is from Europe. Here it is a radical proposal to suggest private hospitals, and the idea of different forms of funding is utterly alien and incomprehensible. Given how ostrich-like even the continental politicians are in the face of demands for health reform, it is a frightening possibility that Swedish politicians might try to hold out longer against reform than anybody else. The others are going to get enough trouble as things are. But given the extreme sacredness of health care in Sweden and the extent it has become the symbol of the Swedish Model – and hence linked to all the patriotic values we do not express towards flags or anthems but still keep as fiercely as any American – then a failure or disillusionment with the system could cost Sweden dearly. Already the cracks in the model is, in my opinion, a serious cause of the extreme sick leave statistics of the nation: a kind of low level anomia stemming from the thought that the System is not working as it should. Imagine what happens if this spreads, either due to financial constraints causing ever greater discrepancies between actual and available elsewhere treatments, or increasing perception of such discrepancies regardless of whether they are real. That would further stress the system through low-level depression and discontent expressing itself through hard to treat and expensive social illnesses. Of course, solving things is hard even when the need for transformation is obvious and possible to discuss. One cannot just try to manage down consumer expectations like the UK is trying to do – everybody will look abroad and see what the others are getting. Just allowing health care markets or customised personal insurance/vouchers or whatever will merely increase flexibility and competition, not necessarily make people happier (and during the transition, costs will increase). Probably the best place to start is in culture: accept a change in the patient-doctor relationship and see preventative medicine as the key. Finding ways of providing trustworthy, accessible health information is a good first step: it can be attempted by both private and government groups (and hopefully someone will find out how to do it well). From that start a culture of patient choice can be grown, and the system adapted to it. It will likely involve a commodification of health care, in itself a controversial but necessary step. As long as health care systems are too sacred to be criticised and subjected to alternative solutions they will remain static, disliked and unequal. I just put up the Eudoxa website on a MT platform. After all, what a think tank is doing is very much like blogging, and having a simple publishing system all members can use wherever they are in the world is very valuable. As for information design, I think we still have a bit further to go. But at least now one can find the old postings.